"Jana knows how to really entertain an audience. Her voice, her humor and her songs are excellent. I highly recommend Jana Stanfield." To hear an MP3 sneak preview of this song (from Jana's upcoming CD), click here. Jana sings the lyrics in English, Hebrew and Arabic. Watch some "Psychotherapy you can dance to!" The amazing Jana Stanfield performs her original song "George Bailey" (Jana Stanfield/Deanna Walker) from the CD "What Would You Do This Year If You Had No Fear." Watch and see why this is many people's favorite song from her new CD. Inspired by one of Jana Stanfield's favorite movies, "It's A Wonderful Life," and her passion for traveling the globe doing Keynote Concerts, the song "George Bailey" was born. The video for "George Bailey" features personal footage from Jana Stanfield's travels all over the world. What would you do this year if you had no fear? No more waiting! You've heard her music on 20/20, Entertainment Tonight, Oprah, the movie 8 Seconds, and radio stations nationwide. Her compositions are sung by Reba McEntire, Andy Williams and others, and Jana has shared stages with fellow performers ranging from Kenny Loggins to The Dixie Chicks. 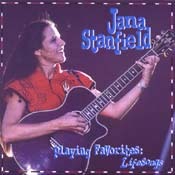 Jana Stanfield at Carnegie Hall - Jana Stanfield - This LIVE CD lets yoou experience the fun of being at Jana's concerts. Tnjoy Carnegie Hall's spine-tingling intimacy combined with Jana's internationally recognized award-winning songs. Larry's Review: Jana's songs and the message they bring to your ears is of great value to you and all who listen. Click here to listen to a brief sample of "If I Had Only Known." To order the single, click here! Let The Change Begin - Jana Stanfield - This set features 20 new songs, most with the backing of a full band. Larry's Review: WoW!! Jana's music will inspire and awaken the real you. Her newest CD and best (with a few surprises!)! Click here to listen to a brief sample of "You Decide" or here to sample the title song, "Let the Change Begin!" Sing - Love - Dance! 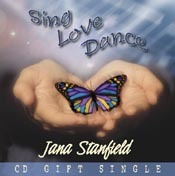 - Jana Stanfield - This CD gift single is dedicated to every person who feels limited sometimes by the fear of not having what it takes to freely sing, love, dance and be. To hear a sample, click here. Larry's Review: Incredibly inspirational. I slipped it into my CD player in my car, put the top down, put it on repeat and turned up the volume! Jana is truly an artist with words and music. Her best yet! Brave Faith - Jana Stanfield - This set features 20 new songs, most with the backing of a full band. Set against this backbeat, the lyrics are just what you've come to expect from the "Queen of Heavy Mental" with lots of positive themes and life lessons. Truly a great artist. Larry's Review: Close your eyes and listen to one of Nashville's newest and brightest stars. Click here to listen to a brief sample of "If I Were Brave" - my favorite. 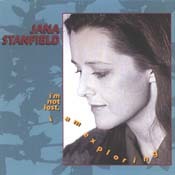 I'm Not Lost, I'm Exploring - Jana Stanfield - An inspiring collection of songs about the adventure of being alive. Nine songs. 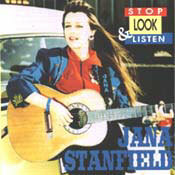 Stop, Look & Listen - Jana Stanfield - An album filled with Jana's thought-provoking lyrics about the value of appreciating the good that life has to offer. Eleven songs on one wonderful CD. My favorite: If I Had Only Known. 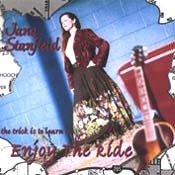 The Trick is to Enjoy the Ride - Jana Stanfield - A theme album with an attitude... a positive attitude. Eleven uplifting songs. Playing Favorites: LifeSongs - Jana Stanfield - Featuring one of Jana's most requested songs, "Turning My Stumbling Blocks Into Stepping Stones," this is a mood altering collection of music that will lift your spirits and leave you with a smile. Ten songs. Click here to contact Jana Stanfield!